90 Days To Start A New Life: For Refugees In The U.S., What Happens Next? Cathy Meaney (right), a volunteer with International Neighbors, sits with Rahim Nishat and two of his children in the Nishats' apartment in Charlottesville, Va. The Nishat family is from Afghanistan. 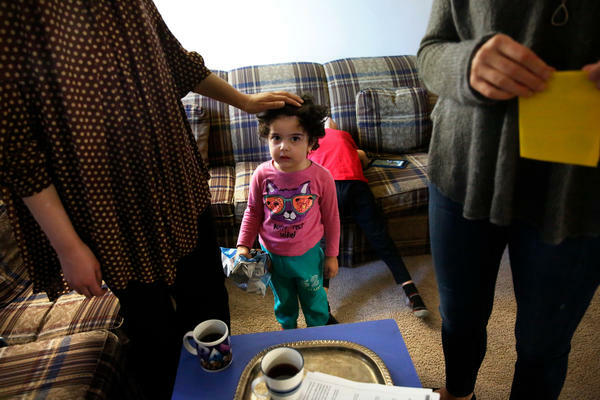 Fields (right) visits with Asmaa Dawoud, a refugee from Syria, while her daughter Dana looks on. Helga Hiss gives a driving lesson using a metal toy car and a piece of white paper with lines that represent a T-shaped intersection. 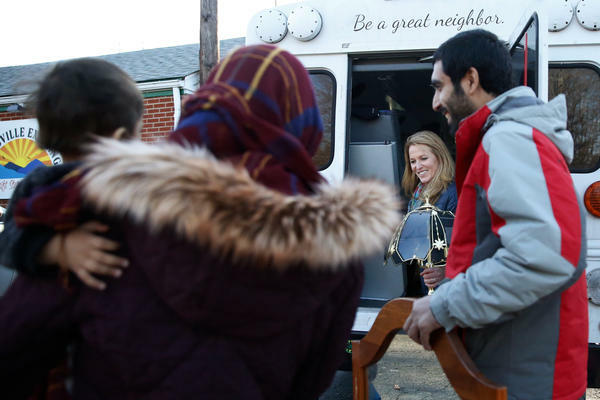 On a typical day, Liza Fields, a member of International Neighbors' board, can be found driving around in her Honda, giving refugees rides to clinics or sitting with them to fill out paperwork. Kari Miller, the founder of International Neighbors, helps the Zaki family, who resettled from Afghanistan, load up the donated items they received from the Earlysville Exchange. The exchange is a thrift store just north of Charlottesville. When Kari Miller was a teacher in Charlottesville, many of her students were recent arrivals and struggled with all kinds of problems. The University Heights apartment complex is home to many refugee families in Charlottesville. The Nishats and the Meaneys get together every couple of weeks. (Top) Cathy brings cupcakes for Ezatullah's birthday. (Bottom right) Rahim tends to a boo-boo. (Bottom left) Playing with dolls. Ezatullah, 8, loves school, where he is working on learning English and Braille in addition to his native language, Pashto. Here, he plays his new harmonica. Here's a number: 90. That's how many days most refugees arriving in this country have before the basic resettlement money they get from the government runs out. But once that three months is over, there are still so many things recent arrivals need. That's what Kari Miller saw over and over as a teacher in the public schools in Charlottesville, Va. In her classes, students who had recently arrived in the U.S. as refugees were struggling with all kinds of problems, like serious dental issues, or a lack of winter clothes or just the challenge of adjusting to life and school in a new land and a strange language. "How could I expect them to learn English in my class amid all this?" she asks. She asked her principal for permission to take children to clinics, to buy them winter coats, to go home and meet their families. 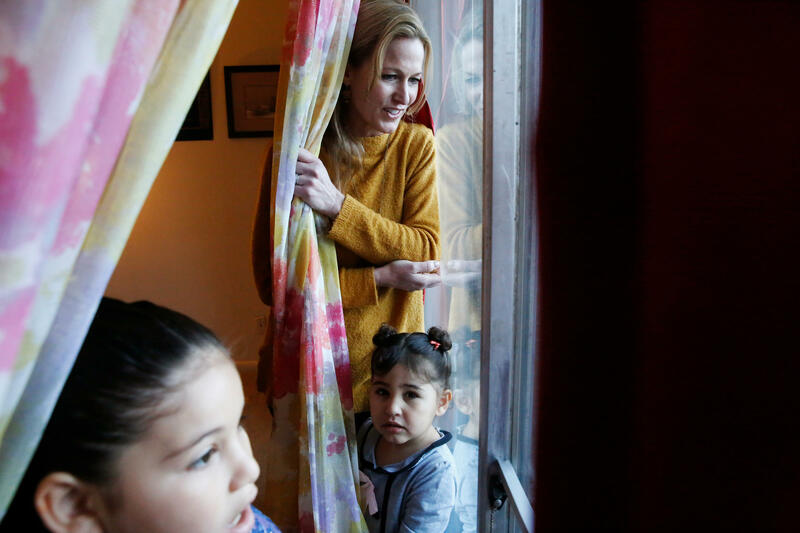 As Miller began helping these students, she was surprised to learn that many of her friends and neighbors in Charlottesville had no idea that their city had a long history of resettling refugees, taking in a couple of hundred a year. There are now about 3,500 living there. But they were visible to Miller. And seeing them every day at school gave her an idea: Connect these families to their Charlottesville neighbors. Working out of her garage, Miller started the nonprofit International Neighbors. That was two years ago, and the organization has now grown to more than 200 volunteers. Many of them work full-time jobs but are ready to jump in to help families in that crucial period after the government aid runs out. There are so many questions: Where can I get a car? Is school closed today? How do I turn on my shower? And, please, help me fill out all this paperwork! Paperwork, that's the real currency in the United States, says Liza Fields, a member of International Neighbors' board. She says that's an idea she heard over and over again from the refugees she works with. Fields helps refugees fill out those many, many forms — mostly for medical care but also dental work, school needs and, of course, paying bills. On a typical day, she can be found driving around in her Honda, giving refugees rides to clinics or sitting with them as they enroll in various sliding fee programs that help them access dental and medical care when and if their insurance doesn't cover what they need. Amid all that driving around, Fields has established a deep connection with one Syrian family, the Dawouds. Right now, she's trying to get the family's two young boys, Amer, 6, and Hamza, 5, signed up for soccer. The No. 1 request refugees make of International Neighbors is for a car. That's usually followed closely by another related request: driving lessons. The organization provides money for lessons. But some volunteers like Helga Hiss are willing and able to give lessons. That, says Kari Miller, is the sweet spot. Hiss has lived in Charlottesville for 18 years but only got to know the refugee population through volunteering, first for the International Rescue Committee — the official resettlement agency in town — and now for Miller's group. 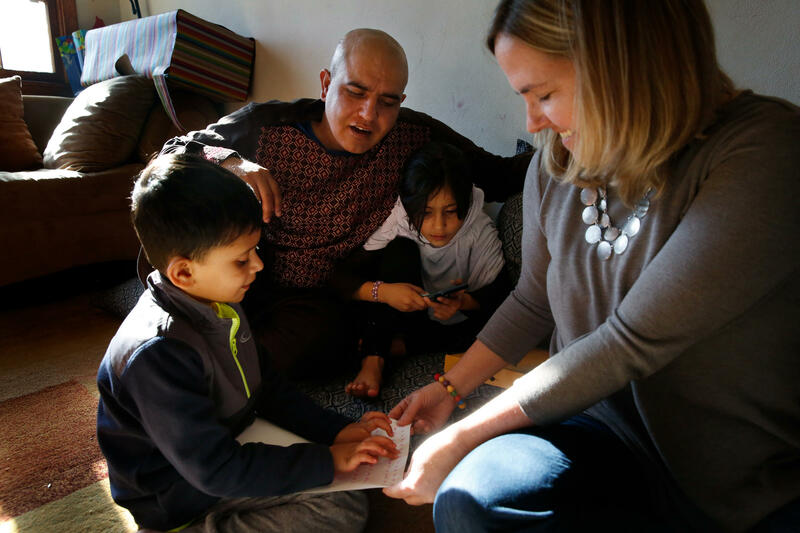 Last fall, Hiss started giving driving lessons to a woman named Neegeeta, who moved to Charlottesville with her family from Afghanistan about 2 1/2 years ago. 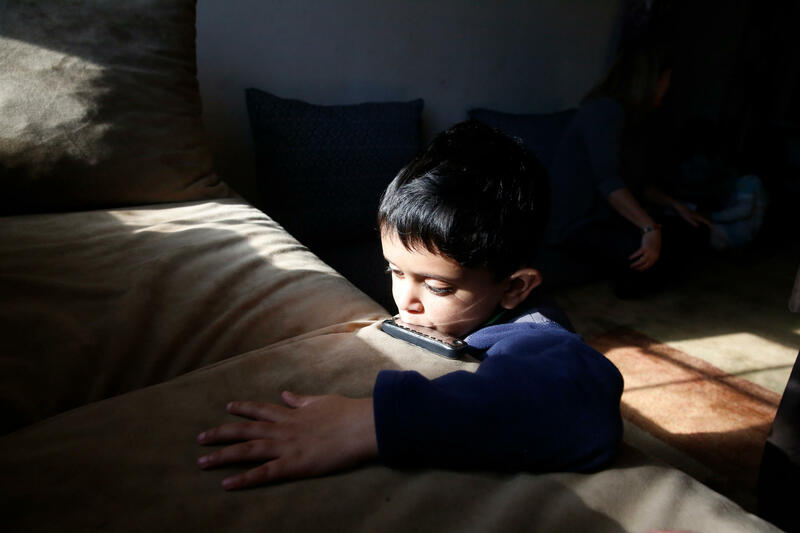 "It was very, very difficult life," Neegeeta says as her 18-month-old son, Musadiq, crawls into her lap. She asked that we use only her first name in order to protect family members who remain in Afghanistan. That first year in the U.S. was so hard, Neegeeta says, that they thought about moving back to Afghanistan. She felt isolated. She was working on her English, taking care of her three children, and dependent on a bus transfer to get her to appointments. "When I think about it," she recalls, "to go with three kids on the bus it was really hard." But, month by month, things got better. Her husband got a good job. The family got a car. They moved into an apartment downtown. Neegeeta credits much of this newfound confidence to volunteers like Hiss, who she says helped her feel welcome as she drove around her new city, laughing — and praying — in Hiss's Toyota Camry. Those lessons, Neegeeta says, changed everything. Gave her freedom. After months of practicing, Neegeeta passed her driving test this winter. She has since talked up Hiss's lessons to her family and friends. Hiss is starting to teach Neegeeta's aunt. As the lesson begins, Hiss has a pile of metal toy cars on her lap and a sheet of white paper with lines to represent a T-shaped intersection. "Pick a car," she instructs. Neegeeta's aunt goes for the silver one. Lesson No. 1: "Always drive in your lane." Neegeeta translates from English to Dari. "Just feel the car, like you're friends," Neegeeta explains. 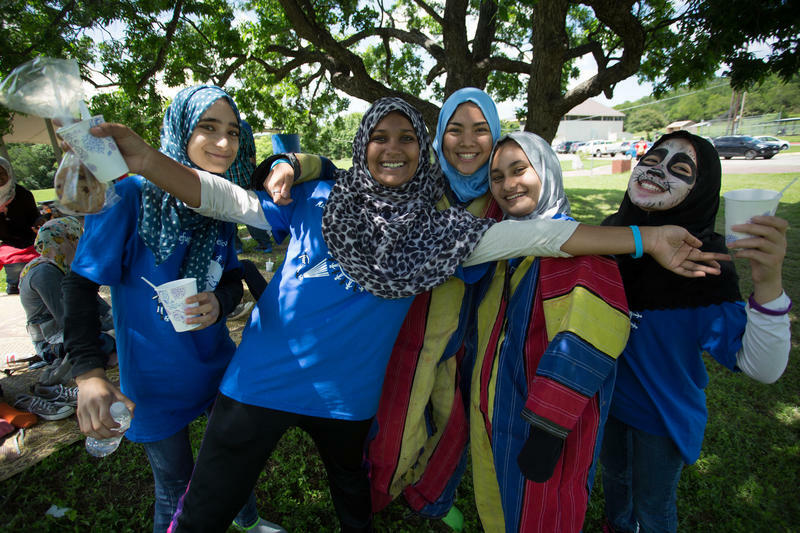 International Neighbors does many things, but the program Miller is most proud of matches Charlottesville residents with a refugee family or individual. They try to pair families with similar makeups: children who are the same age, single moms with other solo parents, or young adults. Rahim Nishat's family — his wife and four children — was paired with Cathy and John Meaney, who have been living nearby with their two children for 15 years. Rahim worked for the U.S. government in Afghanistan before resettling in Charlottesville. Today, on a sunny Saturday morning, Cathy and Rahim are sitting on the floor of the Nishats' apartment, sorting through the kids' backpacks. Cathy walks the family through a report card and then an IEP — the individualized education program that outlines the school's plan for Rahim's oldest son, who is in special education. She explains that Ezatullah gets a special Braille teacher who is assigned to him because he's blind. The two families get together like this every couple of weeks. After the backpack sorting, it's time for the cupcakes and candles that Cathy brought over — a belated birthday celebration for Ezatullah. The Nishats and the Meaneys huddle around the boy. Rahim protectively cups the back of his son's neck, and they all sing happy birthday — with Cathy's and John's voices mingling with the kids', who already know this song by heart. This is part of Kari Miller's vision: Volunteers aren't just helping out, they become real neighbors — and ultimately, friends. Cathy uncovers the wrapped gifts she has brought — a shirt for Rahim, a much-coveted vacuum for his wife. She saves Ezatullah's gift for last. She hands him a gift bag and the 8-year-old rips through the tissue paper, rummaging around the bottom. His hands find the shiny metal chunk: a harmonica. Rahim directs him in Pashto: "Blow, blow!" After a few failed attempts, the instrument lets out a long, screeching high note and Ezatullah explodes in giggles. It's infectious. A shared joy — across language, culture and continents. Our Take A Number series examines problems around the world through the lens of a single number. The number for today is 90. It's how many days of government funding most refugees who arrive in this country have to resettle. In Charlottesville, Va., there's an organization that steps in. 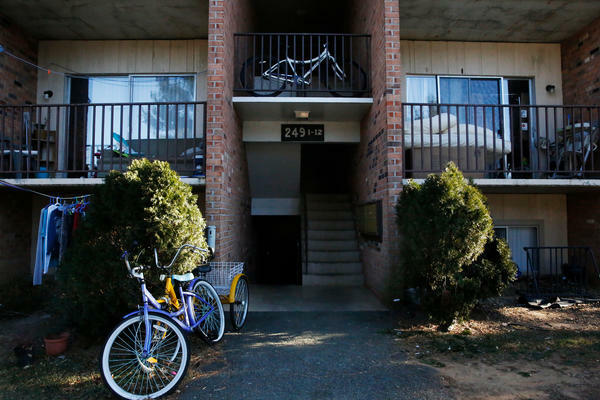 They've found a fine resource for helping these families make a new home - their neighbors. NPR's Elissa Nadworny reports. ELISSA NADWORNY, BYLINE: Kari Miller's voicemail is always full. NADWORNY: A reminder of just how many things refugees need help with. UNIDENTIFIED WOMAN #3: I need help. UNIDENTIFIED MAN #1: Who else going to help me with me and my family? NADWORNY: So many questions. Where can I get a car? Is school closed today? UNIDENTIFIED WOMAN #4: My two sisters, they need driving lessons. NADWORNY: How do I turn on my shower? And please help me fill out this paperwork. UNIDENTIFIED WOMAN #5: Please give me a call back. KARI MILLER: It's not a great feeling to arrive in a country and be confused and be depressed and be alone. MILLER: People don't know that this amazing population exists. NADWORNY: Charlottesville gets a couple hundred refugees a year. There are now about 3,500 here. And seeing them every day at school gave Kari an idea - connect these families to their Charlottesville neighbors. MILLER: Everyone needs a friend. NADWORNY: Working out of her garage, she started a nonprofit, International Neighbors. It's grown to nearly 230 volunteers, ready to jump in after those first few months. They help answer all those questions Kari gets in her voicemail. And above all, they're good neighbors. HELGA HISS: Good morning. I'm so excited. NADWORNY: Helga Hiss is one of those volunteers. She's lived in Charlottesville for 18 years but only got to know the refugee population through volunteering. Today in a downtown apartment, she has a pile of metal toy cars on her lap - tools for a driving lesson. HISS: Pick a car, Selma. What's your favorite color? HISS: She goes for the silver. NADWORNY: It's her first lesson with an older woman from Afghanistan. The woman's niece, Neegeeta, serves as a translator. NADWORNY: Neegeeta has heard this lesson before. Helga taught her how to drive. And last month, Neegeeta passed her driver's test. She told her aunt Helga's the best. NEEGEETA: She's taught me just feel the car, like you are friends. And these things really help me. NADWORNY: Those lessons, Neegeeta says, they changed everything. They gave her freedom. NEEGEETA: When I think about it, to go with three kids on the bus, it's very hard. NADWORNY: Her 1 1/2 year old son, Musadiq, crawls up into her lap. NADWORNY: Her family arrived from Afghanistan about 2 1/2 years ago. That first year was so rough they thought about moving back. NEEGEETA: And it was very, very difficult life. NADWORNY: But month by month, things got better. Her husband got a job. The family got a car. HISS: Always drive in your lane. Can you translate that for her? NADWORNY: The driving lesson continues. Helga steers the silver toy sedan down a sheet of paper simulating a road. And then, they head out in Helga's Toyota Camry to practice. HISS: Alright, off we go. NADWORNY: Across town, another connection. RAHIM NISHAT: Welcome, welcome, welcome. CATHY MEANEY: Nice to see you. How are you? NADWORNY: Rahim Nishat worked for the U.S. government in Afghanistan before settling in Charlottesville. 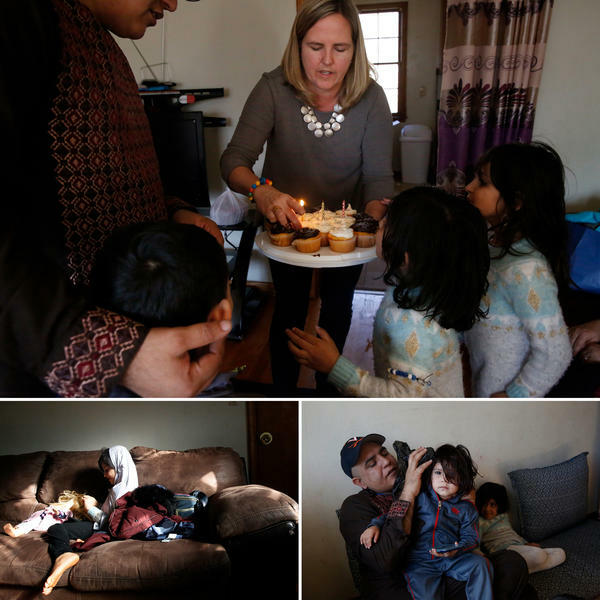 International Neighbors paired Rahim's family, his wife and four kids, with Cathy and John Meaney who have been living nearby with their two kids for 15 years. MEANEY: This is Farnas's (ph) report card. NADWORNY: Today on a sunny Saturday morning, Cathy is sitting on the floor of Rahim's apartment, sorting through the kids backpacks. EZATULLAH NISHAT: My Braille teacher's name is Ms. Ambers (ph). NADWORNY: That's Ezatullah piping in there. He's the oldest of Raheem's children, about eight, and he's blind. Ezatullah leans against Cathy's knee as she and his dad look through his schoolwork. 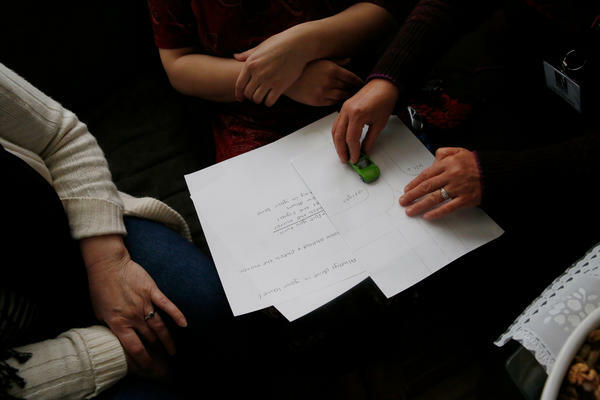 He runs his hand across one of his Braille worksheets showing off the letters he's learned. NADWORNY: The families get together every couple of weeks, solving problems, talking about their kids, eating food. NISHAT: What kind of rice do you guys like - spicy or not spicy? NADWORNY: This is part of Kari Miller's vision. Volunteers aren't just helping out. They become real neighbors and ultimately friends. MEANEY: Ezatullah, would you like to open a birthday present? NADWORNY: The 8 year old rips through the tissue paper. NADWORNY: ...A shared joy across language, culture, and continents. Elissa Nadworny, NPR News, Charlottesville, Va. Transcript provided by NPR, Copyright NPR. It’s been a year since the Trump administration issued an executive order restricting entry into the U.S. from several Muslim-majority countries. The travel ban has faced several legal challenges and immigrant advocates say it’s had a chilling effect on refugees and other immigrants. 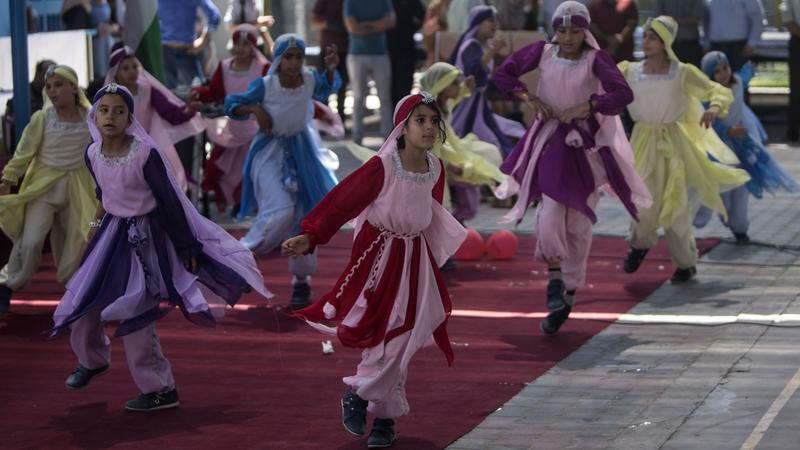 The State Department is withholding $65 million it planned to send to the U.N. agency for Palestinian refugees, calling for reforms and for other nations to step up their support — especially those that criticize the Trump administration's positions regarding Palestinians and Israel. President Trump has cut refugee admissions for fiscal year 2018 by more than half to 45,000 people. This policy shift is already being felt across the country, including Texas.